High School for Coburg: High School for Coburg on Stateline! High School for Coburg has made it to the small screen. 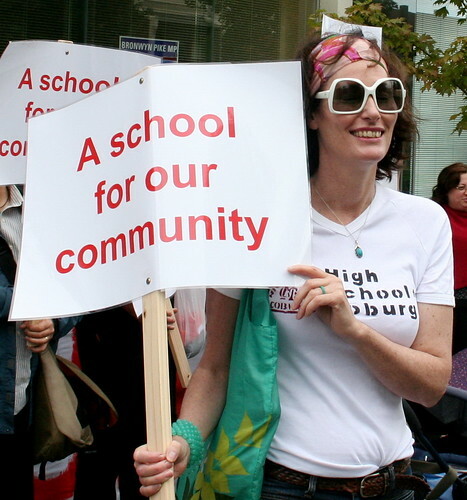 Tune in to ABC1 Stateline at 7.30pm on Friday 7th May to see co-founder Cate Hall telling the High School for Coburg story. Afterwards, let the politicians know what you think. Phone or write to your local member, the Minister for Education and the Premier. Thank you to everyone who was involved for making it happen! Children’s entertainer Mike Jackson will be putting on a show in support of a high school for the community at 10.30am on Saturday 8th May in the meeting room at the Coburg Library. Come along and enjoy songs, stories, lots of laughs, juggling and string! Please be early as places are limited. Thanks for a truly pithy post Cate and Janet. You've done an especially great job of underscoring the misinformation that Minister Pike has been putting about in the media. It's important for supporters of this campaign to have the most comprehensive overview possible and you've certainly delivered.